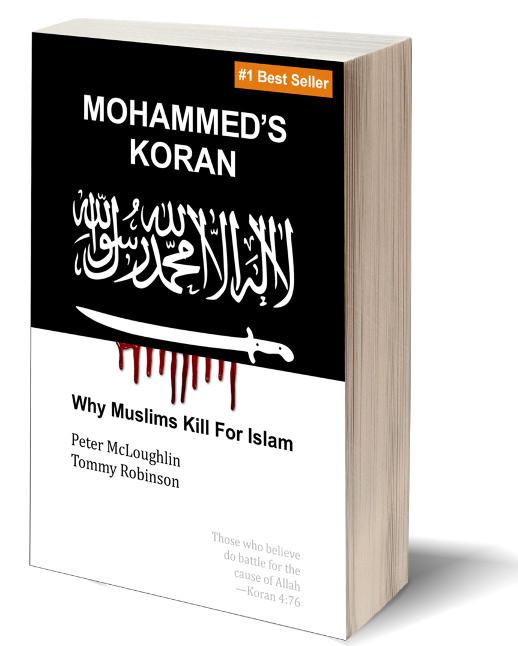 by Peter McLoughlin and Tommy Robinson - 400 pages, 560 footnotes. The new publishing arrangements mean all over the world people can now buy this book banned by Amazon. For customers in those countries where it is cheapest for us to print and ship, we can charge a lower price. Paypal insists all items are shipped with tracking (which adds considerably to the cost of delivery to less populated regions). In July 2017 when this book was published, it went straight to No.1 on Amazon. Yes, the first self-published book in history to debut at the top of the Amazon charts. The media ignored it. Read some of the 1000 five star reader reviews which Amazon also deleted when they banned this book. They banned the only edition of the Koran which denounces the terrorist violence inspired by the Koran. Yet Amazon continue to sell other books which praise racist violence (e.g. Hitler's Mein Kampf). In February 2019, apparently under "orders from above", Amazon banned the No.1 best-selling Koran. Muslim propagandists were delighted with this, proving once more that they are able to enforce sharia law upon non-Muslims in the West.